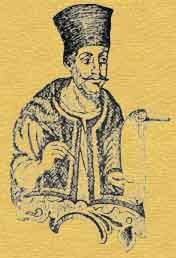 Petros Byzantios, the Fugitive, was born in Neochorion of Bosphorus and became a pupil of Petros the Peloponnesian. Byzantios used the musical scripture of his teacher to write his own works and to 'explain' many lessons written in Koukkouzeles' notation. After his death, these were sold to the Patriarchal Musical School which was founderd in 1815 together with his other manuscripts. He composed a series of cherubic hymns (i.e. one in each mode) and three series of of communion hymns «Αἰνεῖτε» for Sundays. His cherubic hymns and one series of his communion hymn compositions were published in various anthologies under the name of «Petros the Byzantios»; and his shorter communion hymns under the name of «John the Lambadarios». In addition he wrote a short Heirmologion, katavasias, a doxology, kekragaria, «Αἰνεῖτε» of the praises medium in length and other lessons with author «the student» (of Petros the Peloponnesian). In the library of the Holy Sepulcher at Phanar, Constanintople, there is a Papadiki manuscript due to him. Because of his second marriage, he was paused from Archcantor by Patriarch Kallinikos, cantors of the Great Church were disallowed to have a second marriage. He then left to Chersona (hence the name «Fugitive»), and then to Iasion, where he died in 1808.